To be honest, I hadn't thought about going to Iran until about a year or so ago. I had travelled quite a bit in the Middle East, to places like Morocco, Egypt, Jordon and the West Bank and always found them to be fascinating and exotic. But after the nuclear agreement with the West and the re-establishment of full diplomatic relations between London and Tehran, I began to think that now would be the time to go. The more I read about traveling in Iran and the wonderful sites and friendly locals, the more eager I became to go there. So I booked a two-week trip with Intrepid Travel, a company that puts on small group tours and came across as very ethical. I arrived in Tehran in October 2016 and was taken by taxi to my hotel. 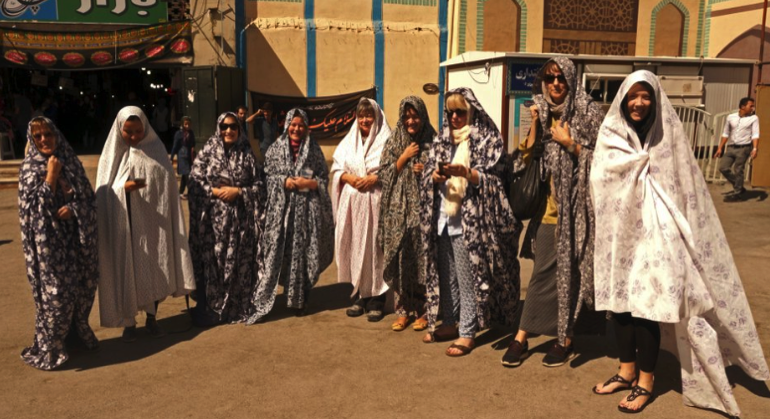 There I met up with my fellow travelers – a mixed-age group from the UK, Australia, New Zealand and Switzerland, plus a young woman who would be our Iranian guide. Although we saw a few sites in Tehran on the first day, to be honest – after only having had two hours sleep the previous night – I was a bit too knackered to properly appreciate it. The traffic in Tehran and the jam-packed metro is something to behold but probably best appreciated when fully awake! The next morning, however, we took an internal one-hour flight to Shiraz in the south of the country. Many people don't realize the size of Iran – it's three times bigger than France and 10 times bigger than the UK! In Shiraz, the holiday proper could get started. Our hotel was delightful, with balconies to each room surrounding a pleasant courtyard. Shiraz is supposed to be the cultural capital of Iran and a visit to the tomb of the great Persian poet, Hafez, is a must. This bustling city has many other great sites – such as Atiq Mosque and the pink mosques – and is within a few hours' drive of the ancient Persian Capital, Persepolis (520-330 BC). When we visited Persepolis and the nearby Necropolis, it was blazing hot with no shade to be found. Fortunately, I came prepared with light cotton clothing and a wide-brimmed hat, looking a bit like Indiana Jones (or so I was told by our guide). 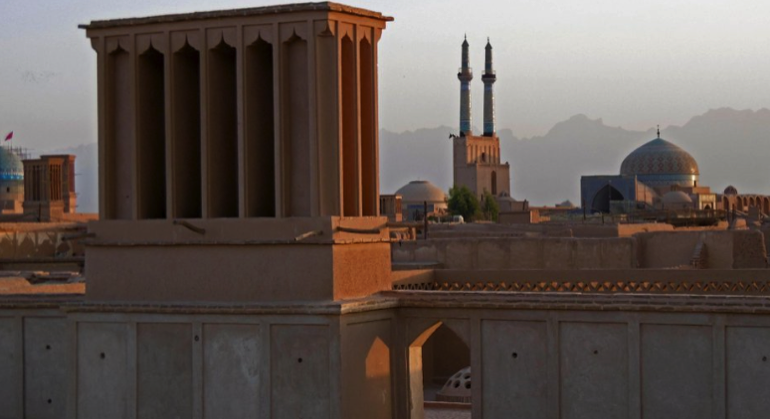 The old town of Yadz, with its rendered mud-brick houses and maze of alleyways, is a must-see on any Iran itinerary. A very interesting feature of many of the traditional houses is an air-conditioning structure called a badgir. These funnel cold air down to ground floor level much like in a termite's mound. Sitting on a rooftop café one evening, one could see dozens of badgirs as well as enjoying a stupendous view over Jamal mosque. Our pleasant hotel was on a quiet road right next to this beautiful mosque. At Yadz, we said goodbye to our wonderful minibus driver and continued to Isfahan by public bus. This was surprisingly comfortable and we were brought drinks by the conductor during the four-hour drive. Isfahan certainly lived up to the hype as the “jewel in the crown” of Iran, with amazing Islamic architecture and mosques. The main attraction has to be Iman Square, which is the second largest public square in the world after Tiananmen Square in Beijing. However, having been to Tiananmen Square, I can say undoubtedly Iman Square is far more attractive. On the way to Kashan, our final city, we passed Natanz – the nuclear enrichment facility – which the West was (probably rightly) getting its knickers in a twist over and which was central to the nuclear deal signed earlier in 2016. We were under strict instructions not to take any photographs. However, when we drove past it, the guards manning the anti-aircraft guns smiled and waved at us! 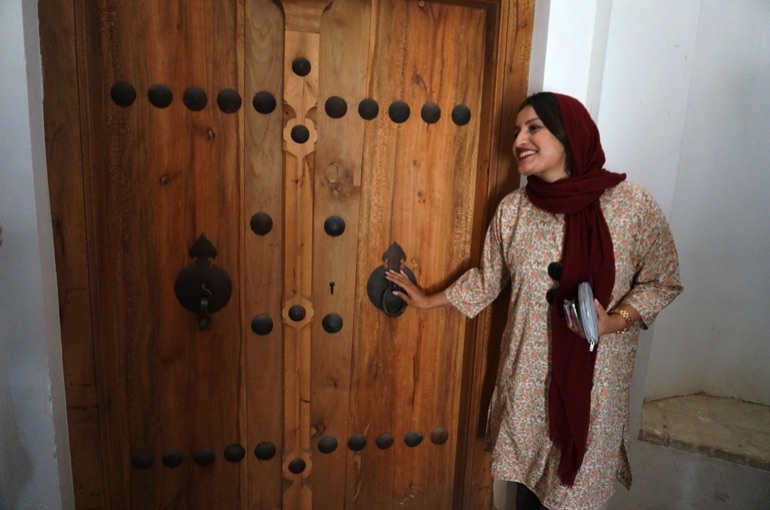 In another unexpected moment our guide explained how on traditional Iranian house doors, there was a different knocker for male and female visitors. Not only are they a different shape (the male ones being long and thin and the female ones being a round hole!) but they made a different sound. This was so that if a male visitor arrived, any adult females in the house would know and could get properly covered up. This we all found quite amusing. She laughed and said we could discuss the shapes in our own time! Kashan itself was very pleasant and we visited two fabulous mansions built by rich merchants. In the evening, we were hosted by a local family, who put on a splendid buffet for us. Although there were many other interesting sites we visited on the trip, a good thing about this tour is that we also had time to explore places on our own. 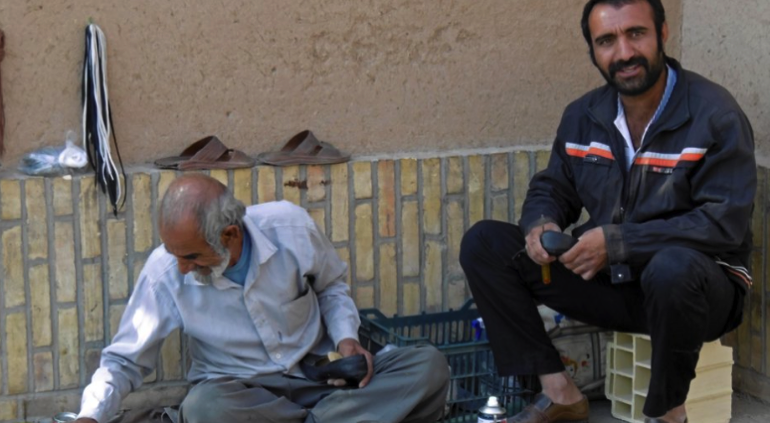 This is when one gets to meet and speak to ordinary Iranians. Many people in the West have been led to believe that Iranians are all Islamic fundamentalists who are out to destroy our democratic liberal way of life. In reality, they are probably the most hospitable people I've met and are delighted that you visited their country. From what I gathered, they were all very pleased about the nuclear deal and wished for a better life without sanctions for their families. The other real delight of going to Iran is shopping in the bazaars, especially in Shiraz, Yadz, Isfahan and Kashan. Not only can one buy many beautiful handmade things – such as tablecloths, in-laid wooden boxes, vases and fine paintings on camel bone – but there is no hassle or pressure to buy whatsoever. The contrast between this leisurely, calm shopping experience and that in the souks in Marrakesh or Egypt was quite marked. 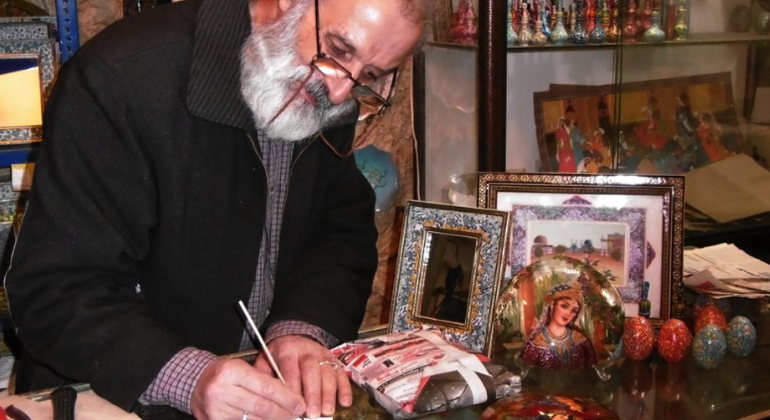 I left the bazaars in Iran with a smile on my face and plenty of wonderful gifts for myself and family. Finally, to answer the question posed at the beginning of my trip: “Is it safe?” Well, as far as the possibility of being robbed is concerned, I couldn't have felt safer. Of course, if one did stupid things like drink alcohol in public, one would be arrested and maybe jailed. The most dangerous part of visiting Iran is the traffic and the mad driving in the big cities. One evening on our first night in Shiraz in particular stands out in this regard. We had to cross a major road with four lanes each way to reach a popular viewpoint over the city. The only way that we could do this was to stop the traffic, as the locals did. So when there was the slightest gap in the heavy traffic, we stepped bravely out into the road. All of the traffic – including large trucks which had been barreling down the road at 45mph – stopped and allowed us to cross without any honking of horns. When we got to the other side, we were all laughing hysterically from a mixture of amusement and sheer terror! The taxi journey back was also a white-knuckle ride with no seat belts and a driver who did handbrake turns in the road to avoid having to wait at traffic lights! 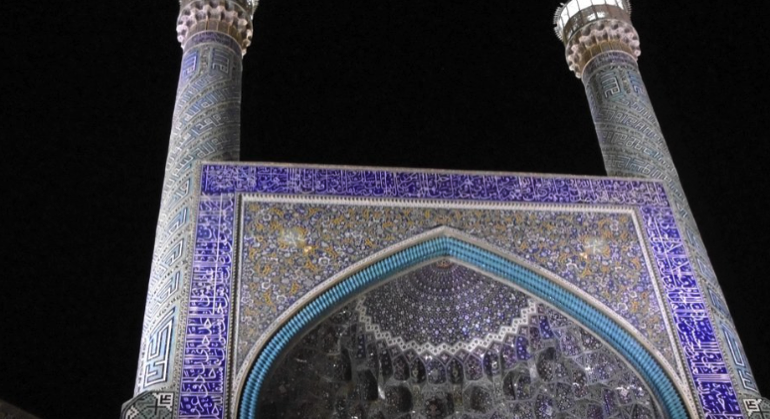 However – that being said – if you visit Iran, just go with the flow and enjoy what will certainly be an extremely enjoyable and rewarding experience. 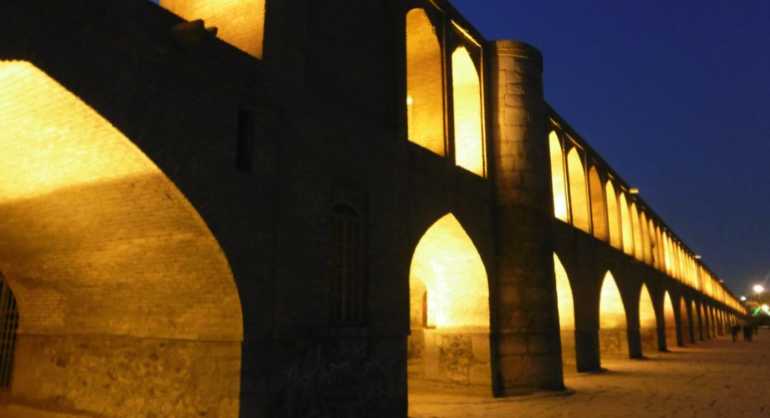 When we visited Isfahan, the Zahandeh river was dry, but this did not stop us from enjoying some of the beautiful bridges, which are architectural gems in their own right. I walked across the Si-o-Seh Pol bridge with my roommate on my way to visit the stunning Armenian Cathedral. I, like many people, had thought previously that the only religion practiced in Iran was Islam. However, besides the ancient religion of Zoroastrianism, Christianity and Judaism are allowed, although the number practicing these religions is less than before the 1979 revolution. One of the real surprises on the trip was stumbling across a Jewish service in a synagogue, where we were made especially welcome (and given vodka to drink!). After two days in Shiraz, we traveled to a nomad village, where we had a great evening being fed and entertained with singing and dancing by a local family. From there, we spent a night in the unassuming town of Eghlid. Although there wasn't a huge amount to see there, it was quite pleasant and peaceful after the big cities of Tehran and Shiraz. We spoke to quite a few of the locals, who were very welcoming and wanted their photos taken with us. Certainly one of the many highlights for me was staying in a restored 400-year-old caravanserai in Zein-o-Din. 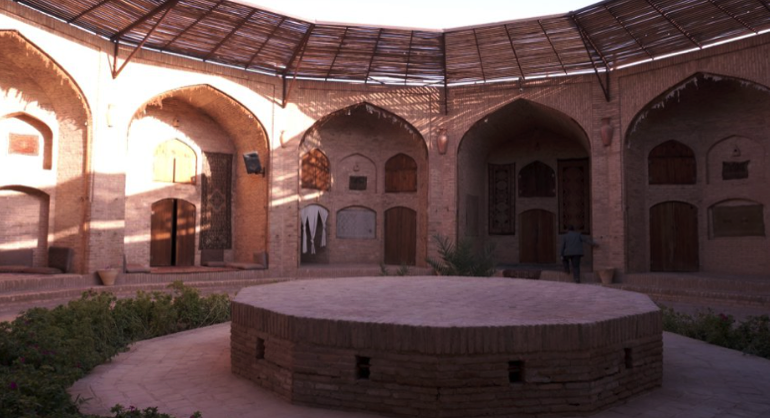 The caravanserai were wayside inns built for merchants on the Silk Road. In the center of the hexagonal building was a large circular platform where the camels would be tethered overnight. Unfortunately, we arrived more mundanely by minibus. Nevertheless, it was very exotic and at night – being in the middle of the desert – we were treated to a sky filled with stars and the Milky Way stretching across to the horizon. Although very interesting, I actually found the mountain village of Abyaneh a bit sad. 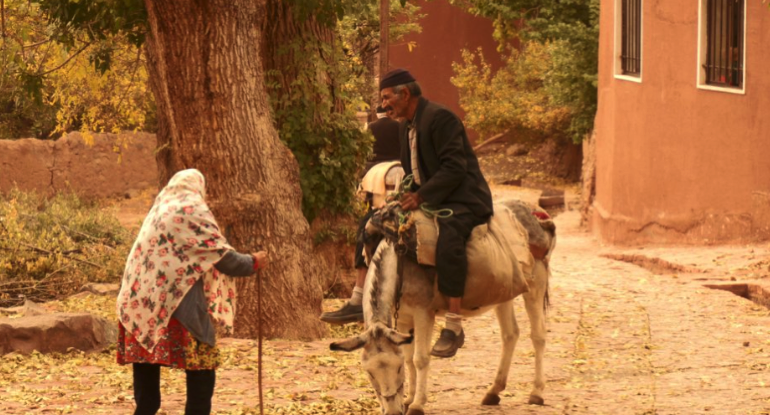 The place seemed full of old men on donkeys or old women trying to sell the few tourists dried apples. When we visited a shrine to the martyrs of the Iran-Iraq war, I could begin to understand why. There must have been around 30 photos of the fallen from the village – all of young men from the age of between around 18 and 30. For such a small place, this must have been a tremendous loss to the community as well as to their loved ones. Phil Munn left London some years ago to move to the Peak District for a better quality of life. He is now taking more time off from running his own company to enjoy photography, sailing, travelling and meeting new people from all cultures. 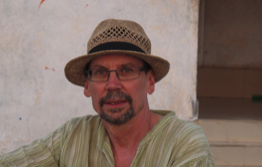 He enjoys independent travel and – if going on a group tour – always tries to choose a travel company where ethics and sustainable travel are a priority.